The American Dental Association held its 148th Annual Session in San Francisco, California. in October 2007 and issued press releases concerning mercury amalgam separators and their plans for writing an "accurate" patient brochure about filling materials. The ADA claims that web sites such as mine (MercuryPoisoned.com), Consumers for Dental Choice (ToxicTeeth.org), Dental Amalgam Mercury Syndrome or DAMS (Amalgam.org), the International Academy or Oral Medicine and Toxicology (IAOMT.org) and a host of others coming out of the woodwork telling their mercury poisoning stories is confusing the public. Despite a wealth of scientific evidence supporting the continued availability of amalgam as a safe and effective treatment option, both the mainstream media and the Internet frequently carry confusing and incorrect information about amalgam. The ADA hopes, through production of this brochure, to provide all dentists and their patients with scientifically accurate information about dental materials to aid them in making informed treatment choices. You can read the press release about the patient brochure in links further down this web site. But the purpose of this article is to discuss the amalgam mercury separators. According to the press release, "the ADA has updated its best management practices for the disposal of dental amalgam waste to include the use of separators, collection devices installed in dental office plumbing to capture and remove at least 95 percent of solid waste particles before they enter the sewer system." Hal Huggins, DDS humorously commented on previous ADA recommendations about disposing of scrap amalgam on page 36-37 of his book It's All in Your Head, published in 1986. In the mid-1980's all dentists were sent a copy of a list of recommendations for their protection against mercury and scrap amalgam. It was published by the Council on Dental Materials and devised by the ADA. It warned of the severe hazards of the vapor coming from scrap amalgam. Scrap amalgam is the part of the filling left over when you have a filling placed. The scrap is put into a can or a box and "saved" to be returned for reclamation. The proper handling of this dangerous material that emits such harmful vapors is considered such a problem that it is recommended that dental students be taught about these hazards as well. 1. Store mercury in unbreakable, tightly sealed containers. 2. Perform all operations involving mercury over areas that have impervious and suitably lipped surfaces so as to confine and facilitate recovery of spilled mercury or amalgam. 3. Clean up any spilled mercury immediately. Droplets may be picked up with narrow tubing connected to the low-volume aspirator of the dental unit. 4. Use tightly closed capsules during amalgamation (while it is being mixed). 5. Use a no-touch technique for handling the amalgam. 6. Salvage all amalgam scrap and store it under water. 7. Work in well-ventilated spaces. 8. Avoid carpeting dental operatories, as decontamination is not possible. 9. Eliminate the use of mercury-containing solutions. 10. 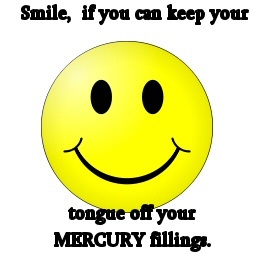 Avoid heating mercury or amalgam. 11. Use water spray and suction when grinding dental amalgam. 12. Use conventional dental amalgam compacting procedures, manual and mechanical, but do not use ultrasonic amalgam condensers. 13. Perform yearly mercury determinations on all personnel regularly employed in dental offices. 14. Have periodic mercury vapor level determinations made in operatories. 15. Alert all personnel involved in handling mercury, especially during training or indoctrination periods, of the potential hazard of mercury vapor and the necessity for observing good mercury hygiene practices. Since scrap amalgam is the other half of the amalgam that is placed in your tooth, it seems reasonable that these recommendations should apply to you as well, if you have amalgam fillings. After all, you have the absolutely identical hazardous material in your mouth. It makes you wonder, doesn't it? Why is the ADA highly concerned about scrap amalgam while it preaches the safety of the amalgam in your mouth? It's the same stuff. is placed under the dentist's sink to stop mercury waste from collecting in the drain trap and going into the city waste water. Dr. Steve Marcus of New Jersey testified before the FDA Advisory panel in 2006 that he collected between 3 to 5 pounds of mercury per year in his separator. Most states do not require dentists to use an amalgam separator because lawmakers receive many contributions from the states' dental associations. In Virginia, the "good old boys" legislators don't want to infringe on the business practices of the dentists. Some of the New England states have taken a lead and passed legislation to require the use of amalgam separators. SAN FRANCISCO, Oct. 2, 2007 /PRNewswire-USNewswire/ -- The American Dental Association (ADA) has updated its best management practices for the disposal of dental amalgam waste to include the use of separators, collection devices installed in dental office plumbing to capture and remove at least 95 percent of solid waste particles before they enter the sewer system. The use of separators will allow greater recycling and reduce the amount of amalgam, which contains mercury, entering wastewater treatment plants.